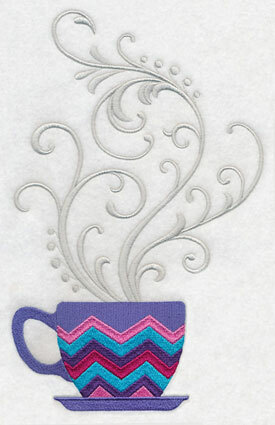 New coffee and tea designs add rich, full flavor to your embroidery projects. 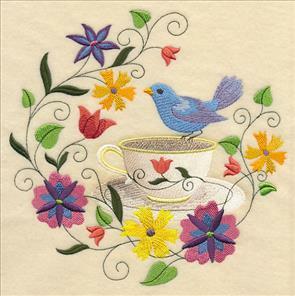 Antique teacups are circled by colorful flowers, and paired with perching butterflies and birds. 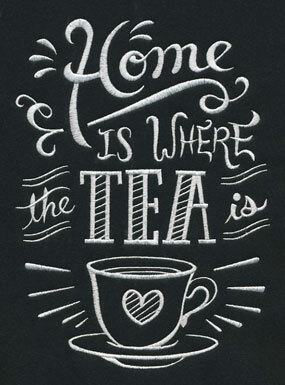 Cool and contemporary chalkboard art add fun phrases to tea towels and mug rugs. 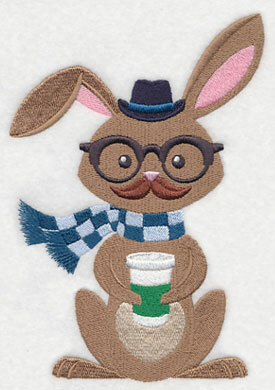 Coffee shop characters add fashionable flair to quilts, jackets, and towels. 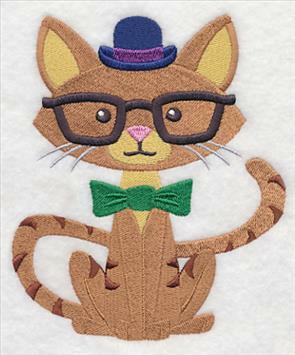 Each wears retro spectacles and has elements to reflect their unique personalities. 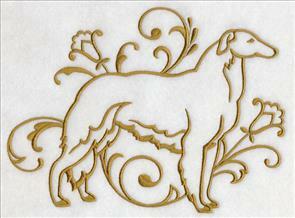 Scroll down the page and let your creativity percolate with project ideas for these designs! 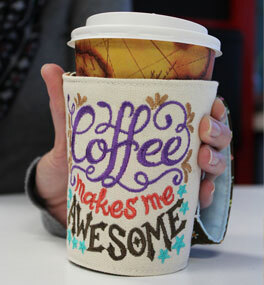 This nifty coffee cozy has a sleeve for the cup, and a loop for your hand! Click here for free project instructions! 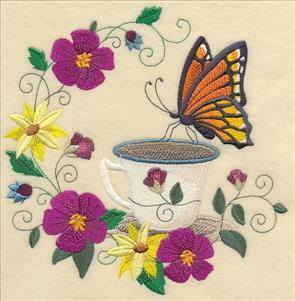 Colorful butterflies perch on the rims of antique teacups. Wreaths of colorful flowers frame the elegant, delicate scenes. 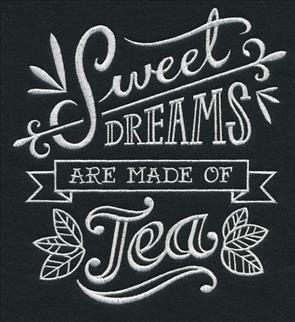 These designs are beautiful on tote bags, mug rugs, aprons, and tea towels. 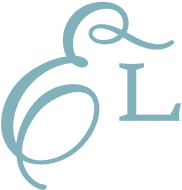 Each design is available in five sizes. The larger sizes are nice to fill the space on pillows and placemats. The smaller sizes can be tucked onto pockets, mug rugs, and the corners of tea towels. 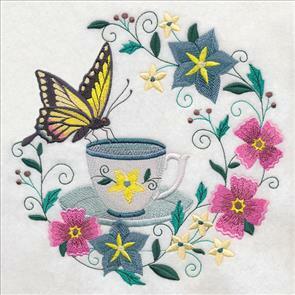 5.95" x 5.87" and 4.94" x 4.87"
These vintage-style designs are reminiscent of hand embroidery. They have open areas and unique stitch types. 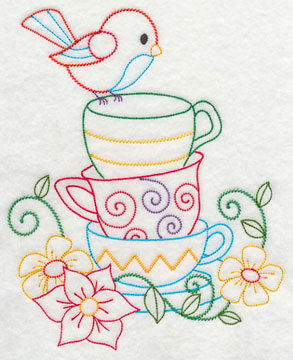 Stacks of colorful cups are lively additions to tea towels and mug rugs. 6.85" x 8.41" and 5.89" x 7.23"
6.85" x 8.73" and 5.88" x 7.50"
4.87" x 6.20" and 3.02" x 3.85"
White thread on dark fabric are the two key ingredients in the contemporary "chalkboard art" trend. 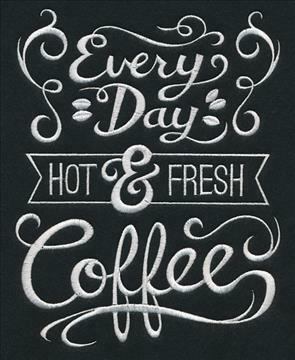 These designs will add a fashionable look - and fun phrases - to your kitchen decor. 4.85" x 6.59" and 2.85" x 3.86"
We embroidered the samples with a bright white on black fabric - but let your creativity run wild! For a dramatic effect, choose fabric and thread colors that are high contrast with each other. 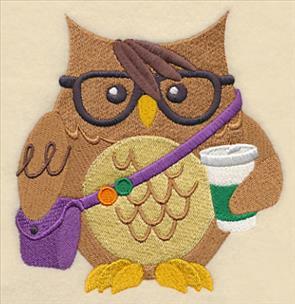 Coffee shop critters with fashionable, retro flair. 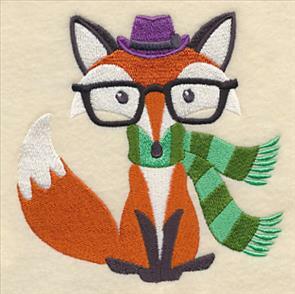 Each wears spectacles that have eye-catching appeal! 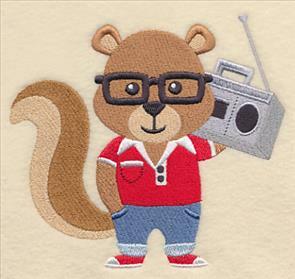 These trendsetters will liven up towels, totes, sweatshirts, and more! 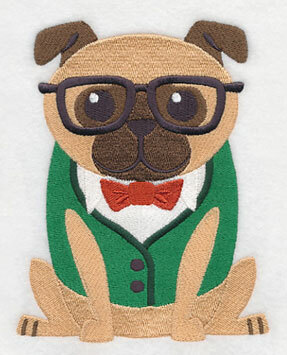 4.85" x 5.06" and 3.69" x 3.85"
Dogs and cats sport bow ties and bold eyewear. 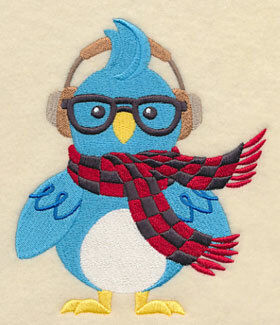 Delightful on jackets, quilt blocks, and tote bags! 4.85" x 5.64" and 3.31" x 3.86"
Spend time in a coffee shop and you'll meet a wide variety of characters - including this sweet bird and squirrel. One listens to headphones, while the other enjoys playing his music loud. 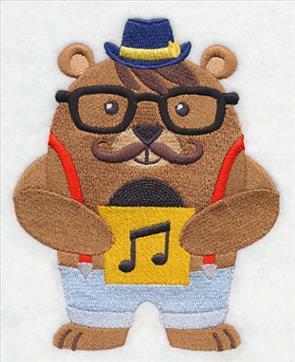 5.39" x 4.86" and 3.86" x 3.49"
Mr. Bear likes to listen to music from vinyl albums. Don't miss his handlebar moustache! 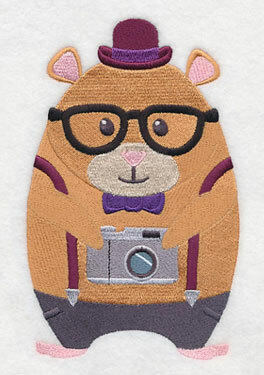 And, the hamster is quite the photographer, with a classic film camera. Both sport colorful hats. 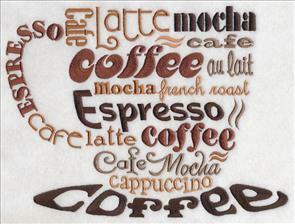 4.33" x 6.85" and 2.44" x 3.85"
Add a cool, smooth, and hip look to your kitchen and coffee projects with these designs! 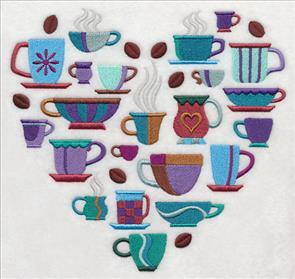 4.80" x 6.87" and 2.71" x 3.87"
Add these coffee shop characters to towels, quilt blocks, pillows, and more! Order the designs singly by using the links above, or get the whole crew in a design pack! 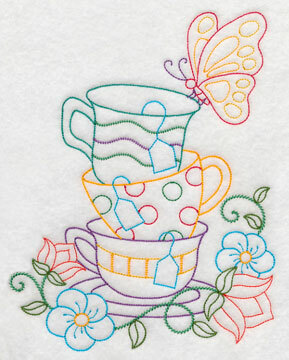 Filigree steam swirls elegantly and delicately from a colorful cup. 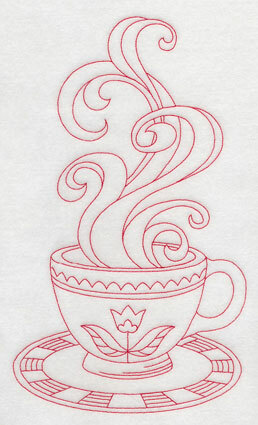 And, the design on the right is digitized as quick-stitching Redwork! 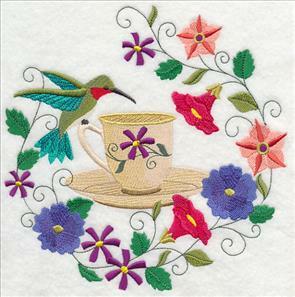 Both designs will add color and charm to kitchen towels and table linens. 6.91" x 10.90" and 5.86" x 9.25"
4.89" x 7.71" and 4.35" x 6.86"
6.90" x 11.65" and 5.56" x 9.40"
Coffee names and words form the shape of a cup, adding contemporary charm to mug rugs, placemats, and aprons. 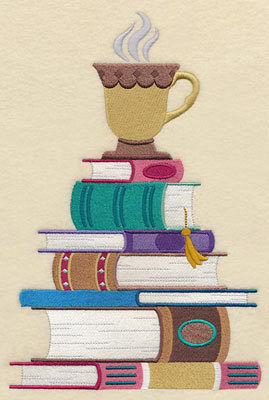 The design on the right shows a steaming cuppa coffee (or tea) on a towering stack of books! Literary lovers will enjoy both designs on kitchen decor and tote bags, too. 5.27" x 7.81" and 4.60" x 6.81"
Love coffee, and tea? 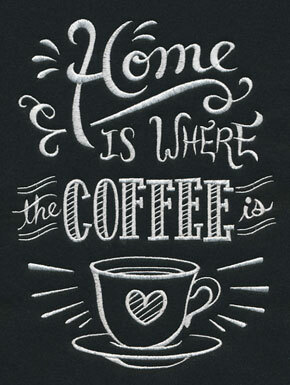 Now you can show your love on aprons, placemats, and tote bags! 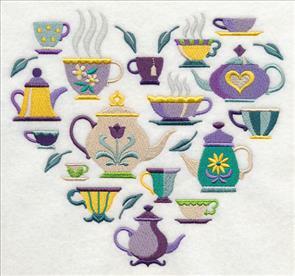 Colorful coffee mugs and teacups form hearts in these clever designs. 7.30" x 6.90" and 6.23" x 5.88"
7.45" x 6.90" and 6.32" x 5.85"
5.28" x 4.88" and 3.89" x 3.60"
Lisa loves the sleek and simple "graceful" dog designs. 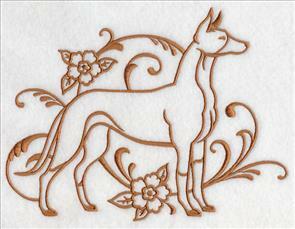 She asked for the Borzoi and Ibizan Hound breeds, and knows her dog-loving customer base will love them! Thanks, Lisa, for the suggestion! 7.71" x 5.86" and 6.33" x 4.81" and 3.87" x 2.94"